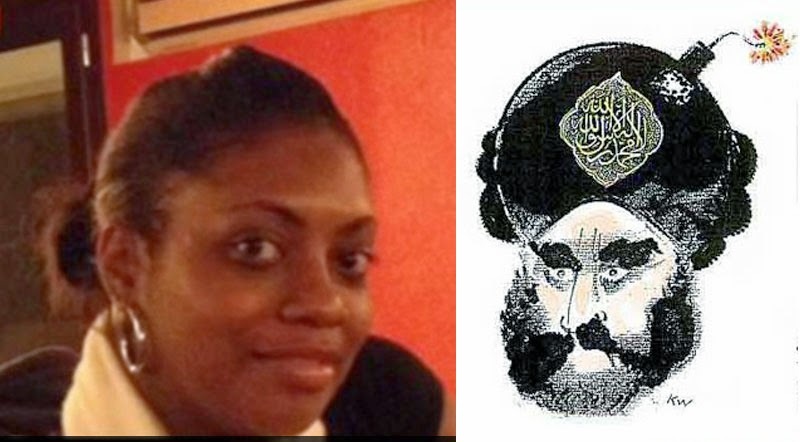 The face on the left is the face of everything that primitive Islam hates about us. It is the face of Clarissa Jean-Phillipe, the young French policewoman gunned down by the African Jihadist thug Amedy Coulibaly. She was young, black and a woman in a uniform, with trousers, boots and authority, a pistol at her waist, with power to instruct, arrest or direct grown Muslim men. Little wonder that she was a target of Coulibaly's savage fury. He was a loser - a poor, unskilled, uneducated, powerless savage, filled with hateful Islamicist bigotry, resentful of freedom and democracy. Statistically, his death has just marginally increased France's average intelligence. Let us be quite clear. There is NO place in western society, in our culture, for Islamicism. There can be no wishy-washy accommodation in which Sharia law is anywhere allowed to be applied. Moslems must accept women and non-Muslims as having the authority of law over them, and accept the equality of all under the law. They must accept that ours is a society in which men can elect to be gay, and men and women can drink alcohol in public. It is the society that they have elected to join - if they want to share the economic benefits, they must accept our freedoms and our democracy. And to all the Clarissas serving in our own police forces, for all the Clarissas in the Met, I thank you and salute you, and stand ready to defend you if necessary from the savage barbarism of the Islamicist bigots. Should de-Islamisation in Europe be like de-Nazification? There was a voice on R4's 'Today' this morning suggesting that we must publicly treat Islamicism with the same repugnance that we reserve for fascism. It was a rare grain of wisdom from the liberal left - for in the post-war de-Nazification process in Germany we may have the blueprint for success. (1) To liberate our people from Islamicism and Jihadism, and to secure a lasting base for democratic national life in peace with the world, all those who have actively supported the Islamicist hatefulness, or are guilty of having violated the principles of justice and humanity, or of having selfishly exploited the conditions thus created, shall be excluded from influence in public, economic and cultural life and shall be bound to make reparations. In Germany, the vast majority of adjudged offenders were dealt with by means of a fine. A third of that number had their employment restricted, a smaller number had property confiscated and the smallest number were permanently ineligible to hold public office. The vast, the greatest, majority were exhonerated - and and I expect the same would apply to Muslims in Britain today. The first I heard of the Charlie Hebdo atrocity was early this morning in my Salzburg hotel room. Travelling back today, it's clear that Europe is still on high alert. Amongst the French front-pages was the simple statement 'La Guerre' - War. Catching up now on the global reaction makes it clear that it IS war - a war between free thought and free speech and the primitive, savage bigotry of Islamists who would stifle all debate and resist all dialogue. The mass of cartoons featuring pens, pencils and brushes that are now everywhere make clear that our response, the enlightened West's response, is not to cry for blood but for ink. And this is absolutely right. If there's one thing our own history has taught us - and by God we were slow learners - it is that you cannot extinguish the light of truth with blood and darkness. And whilst I am proud of the great mass of peoples across the globe now affirming a human right to speak and be heard, I am also shamed by the residual scum amongst us who even now would defend the Islamists in their slaughter. If the lives of those who died yesterday at Charlie Hebdo are worth defending, then so also is the right to depict, ridicule, belittle, satirise and cartoon the 'prophet' Mohammed. Satire, and cartoons, even savage ones, are a sign of our societal health. Yes, they can hurt, but Islamists need to get used to it, and get over it. It isn't going to stop. There's a link in the comments to the post below (H/T Cascadian) to a speech by Egypt's Al Sisi calling for an Islamic enlightenment. Well worth following. And with reference to the Scopes Monkey case, when time allows I will be looking in detail at HMI's report on the Birmingham 'madrassas' to see what place creationism had in the schools' curricula. This matter is so vital - as important as the Cold War - that we need a rebirth of both VOA and the BBC Arabic Service to broadcast reformed Islam deep into the heart of Saudi Arabia, Iran, Iraq and the whole middle east. The message must be skilled and relentless. Tonight will also see the latest PEGIDA mass public witness events - with freezing weather and liberal lefty fury in opposition I will be keen to see the attendance figures. I'm away again for a few days - if I can have patience with the tablet, and there's something interesting worth posting, I shall.